Vikram and Neha: What is inside electronic devices? If you compare this with electronic boards made a decade ago, the emptiness of the board would strike you immediately. Most of the board is empty space and two black chips dominate the real estate. The remaining components are minor: resistors and capacitors. Winbond W9425G6JH: That's memory, storage, or RAM. The fat black things in the bottom look like chips but they are not. The FPE 2020 are tranformers for electrical isolation of the ethernet signal. Everyone knows that computers getting faster, smaller, more durable and more cost efficient. The silent revolution is in the ubiquity of computers. Tiny computers are everywhere. The desktop was once the only computer in the house. Then came along the laptop, then the smart phone. Then your television set-top-box. Routers, ebook readers, the telephone box to give you cheap international calling. Deep inside, all these devices are empty boards like the one above. One powerful chip containing a computer to do everything. The other important fact is that these are a full, general-purpose computers. You can run browsers, games, and email programs on these computers. 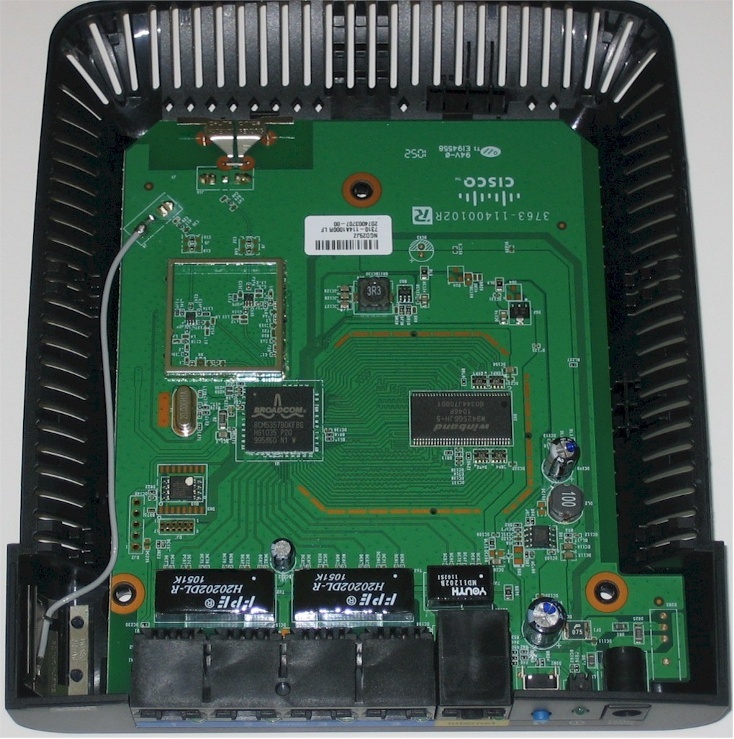 Manufacturers make a board with a general computer and then write router software for it. This method is cheaper than creating a specialized router-only computer. A router is very similar to a television set-top box: they both contain roughly the same parts. The only difference is in the software. We are getting better at manufacturing these full computer chips: they cost less, last long, and fail less frequently. It is not unusual to run these computers constantly for years. This astonishing reliability is one reason why the repair industry is dying. The other reason is that there isn't much left to repair. Boards contain few parts, and if a CPU or RAM chip goes bad due to overheating or electrical surges, it is nearly impossible to repair it. And capacitors and connectors fail much more often than CPU and RAM chips. Since there is nothing mechanical left to fail, and the failure rate of silicon components is low, electronic boards provide decades of service. Another trend to notice is that many of these devices run Linux. Linux has many benefits: it is free, it has support for a wide variety of these new computers, and it is easy to modify.